On December 4 TripAdvisor, the world’s largest travel site, announced a list of top ten tourist destinations around the world. The destinations include Havana of Cuba, La Fortuna de San Carlos of Costa Rica, Kathmandu of Nepal, Jerusalem of Israel, Cusco of Peru, Ambergris Caye of Belize, Sapporo of Japan, Hanoi of Vietnam, Corralejo of Spain and Fortaleza of Brazil.Hanoi ranked eighth among the top destinations and is one of three cities in Asia to make the shortlist, after Kathmandu of Nepal and Sapporo of Japan. TripAdvisor described Hanoi as an attractive and charming city which has preserved its ancient streets, French monuments and architecture. According to Hanoi Department of Culture, Sports and Tourism, the capital city has received more than 4.6 million tourists including 731,052 international arrivals and over 3.955 million local tourists in the third quarter of the year, up 11.2% over last year’s same period.. 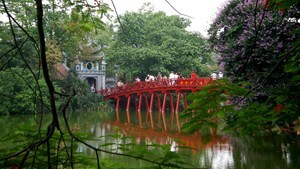 This year, Hanoi hopes to welcome 15.5 million visitors including 2.25 million international visitors.